Newtown, Pennsylvania based Helius Medical Technologies, Inc. announced on June 6th that the company has entered into an agreement and plan of merger whereby the Company has agreed to acquire 100% of issued and outstanding common shares of Neurohabilitation Corporation (“Neuro”) of Delaware by way of a plan of merger. Neuro, a medical device development firm, in January 2013 entered into an exclusive rights agreement whereby Advanced Neuro-Rehabilitation LLC (ANR) granted Neuro exclusive worldwide rights to ANR’s patents, trade secrets and knowhow, including a patent pending technology that will enable the first non-invasive means for delivering neurostimulation through the oral cavity — known as the “PoNs” stimulator. 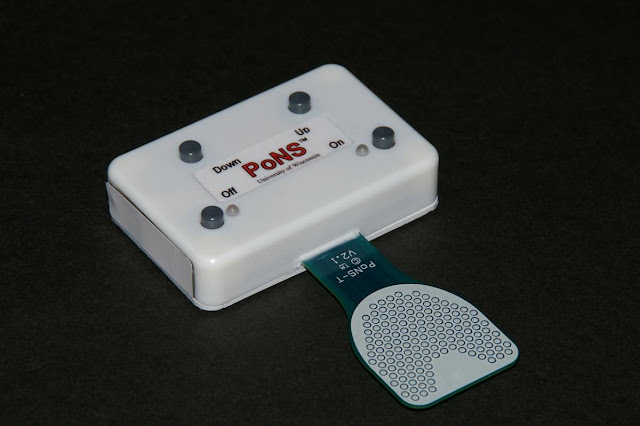 The PoNS unit is a battery-powered device developed by three researchers at the University of Wisconsin Tactile Communication & Neurorehabilitation Laboratory (TCNL) scientists Yuri Danilov, Ph.D., Mitchell Tyler, M.S., P.E., and Kurt Kaczmarek, Ph.D. The PoNS sensor is placed in the mouth where thousands of nerve endings on the tongue can send messages to healthy areas of the brain. The concept is that lingual stimulation combined with therapeutic exercise, enables the brain form new neural pathways for recovering motor functions like balance and movement in persons affected by Multiple Sclerosis (MS), cerebral palsy, traumatic brain injuries, stroke, and Parkinson’s disease. The PoNS is approximately 68 mm wide by 45 mm long by 15 mm thick and weighs approximately 56 grams. An oral tab on the T-shaped device provides the stimulation via 143 electrodes and fits on the anterior portion of the tongue, to be held securely in place by the lips. The PoNS device uses an unbalanced biphasic waveform designed to ensure net zero current to reduce chance of tissue irritation, and has 19 V max and 6mA operational limits. Pulses are delivered to the tongue in triplets of pulses at 5 ms intervals every 20 ms. The subject can control the pulse-width (0.4-0.6 s) by adjusting the intensity buttons on the device. The buttons on the device allow the stimulation to be turned on and off and increased or decreased in intensity. Each time the device is turned off, the intensity resets to the lowest level, requiring the subject to adjust it to a comfortable level each time (Kaczmarek, 2011). The device uses a rechargeable lithium-ion battery, and cannot be in use while charging to prevent risk of electrical shock. The tab, except for the electrodes, is covered with an FDA approved USP Class VI biocompatible polymer to prevent saliva from harming the electronics, and is cleaned with isopropyl alcohol after use. The price of the device, currently as a prototype, is approximately $5,000. The brain’s ability to recognize its operation in response to new information sources, new functional needs, or new communication pathways is referred to as Nueroplasticity — a process that underlies all cerebral learning, training, and rehabilitation. Neuromodulation is the use of external tactile stimulation to intentionally change and regulate the internal electrochemical environment of the brain.